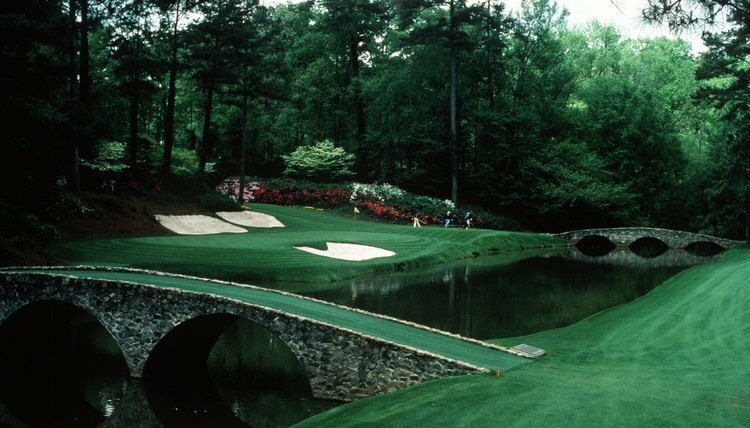 Golf heaven, amen corner at the historic Augusta National Golf Club. Golf lovers who enjoy watching the best on the links have many options to see world-class golf each week. In the past 50 years, golf tours such as the PGA Tour and LPGA tour, have grown from small groups of touring professionals to large international circuits where hundreds of players play for millions of dollars in prize money on the world’s top golf courses. Touring professionals separated from the PGA of America in 1968, and founded the Tournament Players Division, which was renamed the PGA Tour in 1975. The PGA Tour organizes weekly tournaments for male golfers in United States, as well as the possession of Puerto Rico, Canada and Mexico, during 11 months of the year. One of the four annual major championships is in the United Kingdom. Tournaments are 72-hole events, scheduled for Thursday through Sunday, with a cut after 36 holes. Players stay on tour by means of various exemptions. The top 125 players on the PGA Tour money list receive full status for the following year. Players can also qualify for the PGA Tour through a tournament–known as "Q School"–held each fall. The PGA Tour has headquarters in Ponte Vedra Beach, Florida. The Nationwide Tour, a developmental tour for the PGA Tour, was founded in 1990, and has been called the Ben Hogan Tour, Nike Tour and Buy.com Tour during its history. Tournaments are 72-hole events scheduled for Thursday through Sunday, with a cut after 36 holes. Tournaments for the Nationwide Tour are held throughout North America, though tournaments have also been held in Australia, New Zealand and Colombia. Players on the Nationwide Tour have failed to qualify for the PGA Tour through “Q School” or didn't earn enough money on the PGA Tour to finish in the top 125 on the money list. Nationwide Tour players can earn a mid-season promotion to the PGA Tour by winning three events in one season. Tournament purses on the Nationwide Tour are about 10 percent of those on the PGA Tour. Operated by the PGA Tour, the Champions Tour comprises players who are 50 years old or older. The tour was formally founded in 1980, but before 2002, it was called the Senior PGA Tour. Most tournaments are played over 54 holes from Friday to Sunday, and do not have cuts. Many of the top golfers from the PGA Tour have gone on to have success on the Champions Tour after turning 50. They include Mark Calcavecchia, Fred Funk, Greg Norman, Fred Couples and Hale Irwin. The Ladies Professional Golf Association was founded in 1950, and is the main tour for women professional golfers. The LPGA is separate from the PGA Tour and Professional Golf Association, and operates tournaments around the world. Tournaments are 72-hole events, with a cut after 36 holes. The LPGA also operates the Duramed Futures Tour, a developmental tour similar to the Nationwide Tour. The LPGA is based in Daytona Beach, Florida. A former sports and lifestyle reporter at the "Daily Nebraskan," David Green is a writer who has covered a variety of topics for daily newspapers. He was selected by the "Los Angeles Times" to participate in the Jim Murray Sports Writing Workshop. Green holds a bachelor's degree in journalism from the University of Nebraska. How Do the World Golf Rankings Work? What Is a Golf Purse?